Looking back at Andorra La Vella. Luckily for our photo-ops, our 2 night stay on the face of Montserrat in eastern Spain caught the tail-end of the clear weather and the next 3 days of pedaling east from Montserrat to Andorra were under gray skies with some drizzle. We slowly gained about 3,000' in elevation over those days as we worked our way deeper into the foothills of the Pyrenees. Map Man planned a very short riding day from Spain across the border to Andorra's only real city, Andorra La Vella, so as to leave the afternoon free for assessing our options for traversing the tiny country. The 26 mile length of Andorra on the main east-west road wasn't the problem, it was the 7,900' pass just our side of the French border that demanded onsite research and serious strategizing for our out-of-shape bodies and heavy loads. But our first moments in Andorra underscored that there were 2 challenges, not 1, that we would face: we'd deal with bumper to bumper traffic in addition to the very vertical terrain. Unexpectedly, the steep mountain faces were also echoed in the architecture as the absence of flat land resulted in many of the country's buildings being very narrow and 4 to 6 stories tall. Our Andorra experience was to be that of a succession of tall, narrow buildings; steep, narrow roads and steep mountain slopes. The stop and go traffic for the 6 mile ride from the Spanish border to the capital city would continue for several miles past the city, making the traffic jam almost half the length of the country. It was incredible to be running a challenging urban gauntlet in this country of only 66,000 people. The narrowness and density of it all made for difficult riding for us and I hoped that the driving part of the Andorran auto school courses were charging students by the mile driven and not by the hour. Even the climbing wall was tall & narrow. Duty-free shopping is one of Andorra's primary industries and the Spanish flood in from the west to shop for electronics, perfume and alcohol as the French pour in from the east. We wondered if the budget shopping for luxury goods extended to products to satisfy the rich and famous as a dealership for Bentley cars was right there on National Route #1 along with the high fashion apparel. The often shoulderless 2 lane road near the Spanish border couldn't be widened without knocking down the gleaming, narrow shopping centers and the steeply sloped valley meant that there were no parallel streets in many stretches to ease the congestion. We were simultaneously swamped by the intense commerce and intense traffic and yet knew that it often extended little more than a building's width from each side of the road. Like the other tiny countries we've visited, such as the Vatican and San Marino, Andorra is a curiosity. They do things differently in small countries and one of the odd things about Andorra is that it is technically a co-princedom. Only 1/6 of the population was eligible to vote in their 1993 election on the matter of greater, though not complete, independence. Andorra had been tugged on by France and Spain for centuries and had been 'co-owned' by them for many years. Andorra is almost independent now but relies on many services from France and Spain for their existence. The most visible aspect of the co-princedom is the presence of both French and Spanish mail boxes on the street. Domestic mail is free but for international mail you must decide whether France or Spain will handle your mail when you buy your stamp. Tourism, especially skiing, and the duty-free shopping are their big revenue producers and there aren't signs of much else going on in the country. Almost all of the numerous stone residential and commercial buildings with their fine slate roofs looked new and there were many new stone buildings going up (literally, as they are all narrow and tall, even in the countryside). In our brief visit we didn't get any sense of a distinctive Andorran culture, either from the people we met or in what we saw, and the primary language of the retail folks unpredictably fluctuated between Spanish, French and English. Map Man's visit to the tourist information office in Andorra La Vella was unusually productive and we were anxious to get out of the shocky street scene and into the quiet of a hotel room to plan the remainder of our short visit in the country. Bill had really scored as not only did he have a map in hand with elevation indicated at each of the villages on our route and a hotel guide for almost all of the lodging in the country, he also had the always-hoped for attention of the tourist info staff. Actually, the staff gave him the 30-second treatment but the manager in the back room overheard the transaction and set things right. Apparently she heard mention of "bicycle" and appreciated the importance of quality information for our situation. In no time the manager directed 1 staffer to call the police to learn if we could skip the very steepest grades at the top and take the new tunnel instead ("No") and directed another to call the bus service to determine if we could put our bikes on the bus if we got in trouble along the way ("No" again). She decided that her office should locate a hotel for us and again had the staff on the phone. Her first choice was closed for the season but the second was happy to take us and would let us keep the bikes in our room. She supplied Bill with the weather report for the next several days and then began to interrogate him about our level of fitness and previous high-pass experiences. She advised him against making the trip but was going to see that we were well informed if we chose to proceed. The interrogation was unexpected but the detailed information was what we dearly hoped we would get once inside the country. Normally Map Man does all the planning and I just show-up with food that fits the plan and pedal, but Andorra was different. 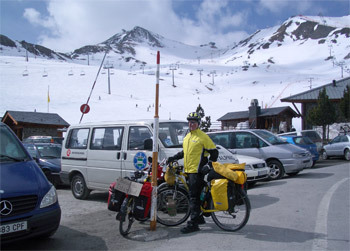 The almost 4,600' elevation gain from Andorra La Vella to the top at Port d'Envalira is something that we have done in a single day numerous times and Map Man had felt prudent enough by making it a 2, not 1, day trip. But the steep grades at high altitudes and the risk of severe weather combined with our deconditioning had sent off alarm bells in my head. It was a startling string of extremes: a 7,900' pass, the high risk of foul weather the first week in April, the unknown amount distance at some unknown amount over 12% grade shown on the Michelin map near the top, and this only being our 5th day on a loaded bike in the last 3 months. I wanted as much information as possible about the grades, daily elevation gains, altitudes and road conditions, plus "Plan B" information like he had gotten about the buses and tunnel, before committing to a plan. My level of strength drops more precipitously than Bill's when we get out of shape and being the weak link in our small team's effort, I needed to be sure I was up to the task. It was suddenly clear that there wasn't a ready Plan B: if we headed out and became too exhausted to continue, even by pushing the bikes up the steepest parts near the summit, there were few options. Hitch hiking or turning around and riding back down to Andorra La Vella were about it. It seemed absurd, but given the shortage of fall-back plans, we settled on breaking the 18 mile ride to the high pass into 3 days. We snickered at the thought of only riding 6 to 8 miles each day with only about 1,200'-1,800' in gain per day but it was the only plan that inspired confidence. The third day would be the hardest as we'd be struggling with the least oxygen to breath while doing the steepest grades and we'd be at the greatest risk from the approaching foul weather, so the first 2 days needed to be easy to leave us some 'umph' for that final day. As sheepish as we felt about our terribly moderate and sensible plan, we were delighted to have found a way to make this challenge achievable so early in our touring season. As we planned our assault on Andorra's pass, we realized that riding over this, the highest pass in the Pyrenees, was very different than the secondary passes we had ridden in the Alps because of the availability of lodging along the way. In the Alps, a pass crossing is more of an "all or nothing" affair. There generally is no lodging or food buying opportunity along the way so we just have to load up and go and keep going until we get over the top and part way down the other side. All of tiny Andorra is a big skiing destination and so we had 5 villages along the 18 mile route to the top with lodging and we could buy food at 4 of them, which made our 3 day plan possible. We were only minutes into our first of 3 climbing days to the top of the pass and we were already thanking ourselves for our ridiculously moderate plan. We hadn't even left the city and we were doing a sustained 10% grade--a grade not indicated on the Michelin map. That was immediately followed by an equally steep descent along a shoulderless length of road--a road that wasn't suppose to have any descents according to tourist info. The bad news was that neither what the Michelin map revealed nor what the tourist info folks had said about the road was accurate, bringing the known challenges of the entire route and plan into question. The good news was that I could do a sustained 10% grade so early in our re-conditioning, which gave me more confidence about tackling the 12+% grades at the top. Based on our information and calculations, we had expected an easy Day 1. The average grade for the day should only have been 3%, which would have been a snap. Instead, this first day physically challenged us with many steep grades and mentally fatigued us with the combined effect of traffic and grades on the shoulderless roads. But as expected, it was a short riding day and we were happy to have weathered the unexpectedly difficult situation as well as we did. And we welcomed the free afternoon hours for a stroll through the small town of Canillo, which of course meant walking up and down 20+% grade streets. Our chance timing for being in Andorra was perfect as we were there mid-week at the end of ski season and we couldn't pass up the 5 star skier's hotel that had slashed its prices. It was hardly a 5 star by international standards, but we reveled in the fun of having terry bath robes to wear down to the tiny sauna and wading pool-sized swimming pool. We had called ahead and made appointments for massages, which were the best things we could do to support our bodies after our first of three climbing days. Their massages had 5 star prices, so we economized with half hour appointments. And we scrupulously avoided the other 5 star-priced services, like using the telephone, but savored the 'free' amenities, like the buffet breakfast and access to the internet. The internet access was a prize for us as we were able to check the weather forecasts on 2 different services, both on the afternoon we arrived and in the morning when we left. The weather was one of the important wildcards as it was after all only the first week in April and anything could happen in the mountains that time of year. It had rained our first afternoon in Andorra, but on our first official climbing day we enjoyed bright sun with with occasional chilling clouds rolling through. The 2 different weather services both forecasted a drastic turn in the weather in a few days with a 20 degree temperature drop even at the lower elevations and a chance of snow. The main difference between the reports was the arrival date of the storm as one forecasted snow the afternoon of our last climb, the other expected the foul weather a day later. We briefly contemplated condensing our climb down to a total of 2 days instead of 3 because of the threat of snow, but finally decided to stick to our plan. Our first day had been much harder than expected so there was no reason to believe days 2 and 3 wouldn't also be more difficult than projected. We would stick to the plan, keep watching the weather and plan on topping the pass before noon on the third day. If the snows came early, we'd layover in a hotel or try to hitchhike the last few miles. The other appeal in sticking to the plan was some hoped-for altitude acclimation by spreading our riding over 3 days. In Portland and then in Barcelona we had essentially been living at sea level so had zero altitude adaptation. By the time we reached Andorra La Vella, we were at 3,300'; our overnight stop at Canillo put us at 5,000' and the following night we'd be at 6,600.' Three nights at successively higher altitudes isn't a lot of time for acclimation, but like with the massages and the careful planning, we were trying to tip the balance in our favor any way we could. One rude awakening from staying at our lovely hotel was discovering the true weight of our gear. We always assume that without camping gear it runs in the 45 lbs range each. A bathroom scale was one of the extra's in our skier's hotel room and "weigh-in" produced some startling results. With making estimates for the remaining gear strapped on our bikes, we were both carrying loads in the 60 lb range, with mine being at the low end and Bill's at the high end. It was a sobering news that added another dose of reality to the list of challenges before us on this high pass assault. 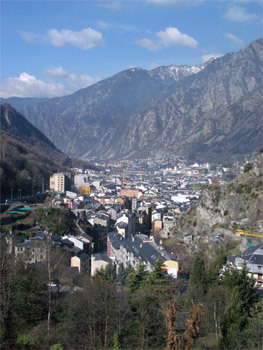 A view of Andorra from near the top of the high road. Our next night, our last night in Andorra, was quite a come-down after our fancy digs in Canillo. It was the last hotel on our side of the high pass in the tiny village of Bordes d'Envalira which sported small two hotels, a restaurant and a gas station on a wide spot in the road. The trendier town of Soldeu was only a mile and half down the hill with much nicer resources but staying at our spartan hotel lopped off a stretch of continuous 6% grade that we wouldn't have to do the following morning. As we discovered the succession of shortcomings in our room, like saggy beds and layers of dust, we kept reminding ourselves of the ease its location would add to our third and most difficult climbing day in Andorra. We were out the door before 9:30 on the morning of our third and last leg up the Envalira Pass--late enough for the benefit of a little warming but we hoped early enough to be over the top by noon and on our way down the other side before the threatened stormy weather arrived. It was a mere 4 miles to the summit but the combination of starting at 6,600' and expecting grades of some unknown amount over 12% close to the 7900' level posed serious challenges to our ability to oxygenate our de-tuned muscles and added to our apprehension. The promised morning showers hadn't arrived and we were instead greeted by partially sunny skies. The low humidity and little wind made the 40 degree temperature pleasant enough climbing weather that we shed our heavy gloves and jackets before getting underway. The 6% grade outside our hotel door took away any chance of a chill and we quickly settled in to a conservative 3 mph pace so as not to let our muscles' need for oxygen exceed our lungs ability to supply it as we had previously experienced at high elevations. We were pleased to discover that our 3 overnight stays at successively higher elevations seemed to have helped us altitude acclimate as we didn't have the expected shortness of breath if we kept our speed low and steady. The bright day invited frequent stops to admire the panoramas--stops that doubled as welcome rests and photo-ops. And with each pedal stroke we were relieved to see that the road wasn't narrowing as we expected nor was the truck traffic as heavy as it had been lower down the mountain, making the riding conditions some of the best we'd seen in Andorra. The probability of me needing to push my bike steadily dropped as the grades stayed in the 6 to 8% range, the winds remained light, and I had all the space I needed on the road to feel safe at our less stable and ridiculously low speed. And even at our high elevations the road surface continued to be absolutely dry and consistently free of gravel or rocks. Our feared worst day on the climb to the pass seemed to be all bark and no bite. Bill passed by the critical 7,000' elevation point without feeling the affects of the altitude as he had on previous high climbs. At that point, our only early indication of altitude effects was the foul taste--almost kerosene like--that our quart of orange juice had taken on, making it easy to understand why mountain climbers at really high elevations find food unpalatable. But a little over 7,400' the characteristic pattern of lightheadedness hit Bill. Drinking OJ hadn't helped him much but surprisingly a few bites on a "ProMax" energy bar we'd hauled with us from Portland immediately made him feel better. His awareness of the rest of his body returned, as did a more normal sensation pattern in his head. Periodic rests and bites on the Promax bar got him to the top with only a little lightheadedness and only 1 wobbly interval. And he felt fine at the top as soon as he stopped efforting and ate a little more. Bill at the summit with most of Andorra behind him. Bill is our "canary in the mine" for hypoxia (too little oxygen) as I am the team canary for hunger, temperature extremes, and difficult climbing conditions. The 'canary' feels the effects first, which prompts us both to stop and tend to the problem, and as a result the less sensitive other person never gets into trouble with that particular element. 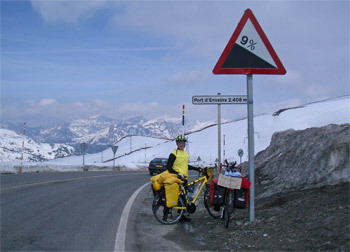 I expected to be the canary for this climb because of the possible combination of elevation, steep grades, narrow road and winds but amazingly the over 12% grades indicated on our Michelin map never appeared, nor did the winds or narrow road that we had feared. We just chugged along at 3 mph with occasional breaks and were at the top at about 10:45 without having to dig deep into our reserves. We couldn't believe our good fortune in making it to the top of a 7,900' pass on our 8th riding day of the season after almost 3 months of minimal riding. Of course, we had made it as easy on ourselves as we could but that only slightly diminished our satisfaction. Barb bundling up for the descent. It was an unglamorous pass summit and we had to scramble to the opposite side of the road to find the mandatory elevation sign for our traditional trophy-photo. In the Alps there are often eateries with outdoor seating and lots of beer drinking at a pass peak, which adds to the festive air of our accomplishments. But here there were only 3 tired looking petrol stations and a closed hotel at the top, which did little to energize our celebration. But the hotel's small doorstep made a convenient chair in our outdoor changing room as we layered on anything fuzzy for the chilling descent. Rain gear for wind protection went on over all the many layers and we prepared for an equally steep, though much quicker, trip down the other side of the mountain. The eastern side of this southern section of the Pyrenees was much more dramatic that the western side that we had looked at for days. The longer, uninterrupted slopes gave these faces a more monumental look. 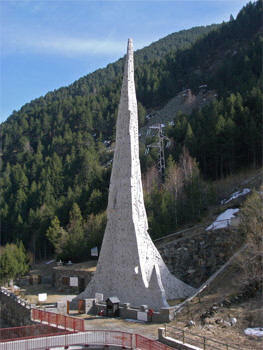 And the ski areas were flashier and closer to the road on the eastern side of Andorra than in the west. It was quite odd to be eyeball to eyeball with skiers shooshing down the slopes and riding up on lifts as we flew down the switch-backed road. 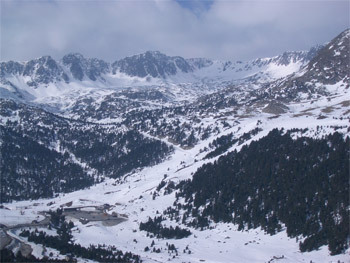 One of the ski areas on the eastern side of the Pyrenees. The Andorran town of Pas de la Casa was our first stop on our long descent down off the peak of Pyrenees. Just yards before the border with France, it was the eastern duty-free shopping Mecca. But unlike Andorra La Vella, the main road bypasses Pas de la Casa, eliminating the miles-long traffic jam at this end of the country. Pas de la Casa was shockingly tacky and had none of the elegant shops of Andorra La Vella. Instead, it looked like a cross between a slushy gold rush boom town and a tacky tourist hub. The cramped jumble of small shops desperately competing for our attention was repelling after the stark simplicity of climbing the above timber-line pass. Bill had planned for us to spend the night at this, the first village over the pass, but we were at the top ahead of schedule so we decided to continue on, only stopping in Pas d' Casa long enough to eat our picnic lunch in the only open space, a church's concrete plaza. As we descended, we also learned that we had climbed up the better of the 2 sides of the mountain. There usually is a better side to go up and one rarely knows which side that is until you've seen both. The French side of the mountain road was more narrow at the top, which would have made the climbing more difficult. It also wasn't as switch-backed, which makes it harder to find places to pull off the road to rest and to restart with ease. And most importantly, it lacked the frequent lodging possibilities, which would have necessitated longer, harder days to make it to the top if we'd gone from east to west. Flying down off of this Pyrenees pass was the first huge downhill we'd done since getting disc brakes a year ago and so it was our first experience with not having to stop periodically to cool our rims to prevent a blowout from overheating caused by braking. Now instead we had to stop to rest our aching hands as we controlled our 100 pounds of gear and bikes down the persistent 8 to 9 % grades. Even at the Andorra-France border we only had to slow as the border guard sang a tune in English about riding a bike as we rolled through. We were thrilled to have topped the pass without digging deep into our emotional or physical reserves and as we descended, we couldn't believe our good luck with the weather. The snow storm hadn't materialized and it was a glorious day. We cautiously began removing a few layers of clothing after dropping about 3,000'. And as we continued down, we were also stunned to have traveled over 20 miles without having to pedal a single stroke--now that's some downhill! 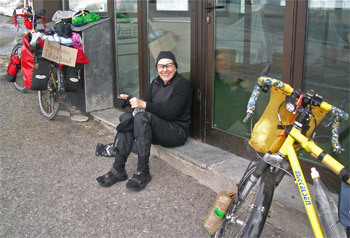 By the time we had to pedal, the temperature had risen from near freezing at the pass to an outrageous 75 degrees. Not only were we shedding all of our 'descent-wear' but we had to make a roadside opportunity for discreetly removing our long-john bottoms that we'd lived in for weeks. 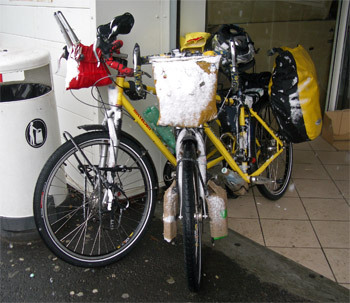 Bill's handlebar bag's snow accumulation from riding. We eventually did have to do some sustained pedaling to complete the downhill side's portion of the 47 miles into Tarascon, France. Going to Tarascon lined us up to easily visit Grotte de Niaux, a prehistoric cave from 12,000-14,000 bce that we missed last year on our more northern tour of caves. Our cave visit was reminiscent of last year, both in the familiar handsome sketches of bison and the drizzly, cool weather. Our lovely 75 degree day over the pass had deteriorated to 50 degrees and overcast, much like home this time of year. But the next morning was the real shocker as we awakened to the snow storm we had dearly hoped not to encounter at the Port d'Envalira. The 40 degree temperature drop in 36 hours was just as startling as the accumulating snow at Tarascon's 1500' elevation. We could only imagine the white-out conditions up top as the very nearby hillside went in and out of sight with the fluctuating snow showers over the next 2 days. We are in the town of Stresa on the lakeside at Lago Maggiore in northwestern Italy at the base of the Alps. Our friend Mulvey Johnson will arrive today on his way back to Portland from a month-long trip to Pakistan and India. The 3 of us will doing some sightseeing in the area with Mulvey on a rented bike. The next big stop for us is Zermatt, Switzerland for a look at the Matterhorn then we'll head east again towards the Dolomites region of the Alps.